Sri Lanka's capital is a vibrant and interesting collage of cultural and historical influences with some very pretty neighbourhoods. This bustling city is built along the coast and is close to many of the country's greatest holiday destinations, including Galle on the southern coast, and Kandy in the central highlands. 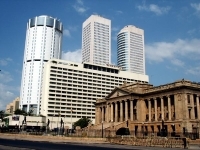 Colombo is not generally considered a destination in its own right, but it is the starting point for most holidays in Sri Lanka and has some worthy attractions. Frenetic traffic fills the main Galle Road that runs through the city from the district of Fort, parallel with the coast, and connects all the suburban enclaves down to the town of Galle in the south. Fort is the historic centre of the city and has become the main business district, filled with shops, office blocks and government buildings. It is here that most of the gracious old buildings from the Dutch, Portuguese and British colonial eras can be seen. East of Fort is the exciting Pettah bazaar district, where the streets are crammed with shops and stalls selling all manner of goods from vegetables to gemstones. Further south the city's seafront is known as Galle Face Green, where locals enjoy games of cricket, fly kites or take evening strolls watching the sunset. Beyond this lies Colombo's upmarket Cinammon Gardens neighbourhood, boasting elegant mansions, tree-lined streets and the lovely Viharamaha Devi Park. The closest beach resort to Colombo is Mount Lavinia, about six miles (10km) from the city.